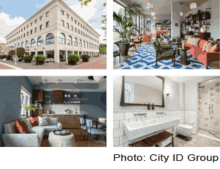 City ID Group is a young fast-growing apartment and hotel company in the Netherlands, which creates innovative hotel concepts that differentiate from the existing offer. Their concepts offer apartments where guests can enjoy the freedom of having their own facilities with additional services of a hotel. Attention to detail is paramount in everything they do and so is their safety concern for both their guests and staff. Mr. Paulo Gomes, maintenance manager was advised that the kitchen floor was real slippery and imposing possible dangerous situation for the kitchen team. He has searched the internet to find a solution and decided to contact MaxxGrib floor safety. “We found Maxxgrib among other solution providers via internet and decided to call them. The initial contact felt immediately well from the start. A professional and clear explanation with a personal approach advising all options and possibilities helped a lot to make a decision in this matter. Especially in what to expect in operational terms. Our kitchen is used on a daily basis and hence we can only allow for little down time. MaxxGrib explained clearly that the kitchen would be good to go after a few hours after the floor safety treatment. Our team proceeded with their activities within a few hours as advised. It has been 5-6 months now and the team is still really happy with the treated floor. "We are glad that we can provide both our team as our guests a comfortable and safe environment to work and relax”.